Whether you’ve been denied social security benefits or you want to divorce your partner, you’ll get the help you need if you choose Tate J Eldridge, PC in Amarillo. Since 1993, our attorney has been helping Texas residents get a favorable ruling in their family law or Social Security disability claim. Contact us to schedule your first appointment with our family law and Social Security claims attorney by calling Tate J Eldridge, PC today. About Tate J. Eldridge, P.C. 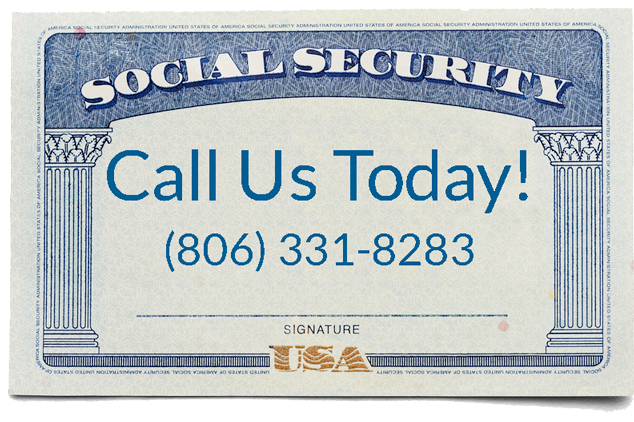 It’s no secret that getting Social Security benefits from the government is difficult. More often than not, claims are denied and you’re left with no solution. Fortunately, Tate J Eldridge, PC in Amarillo, TX, can help navigate you through the claims process. Our Social Security attorney will take a look at your current situation and walk you through the legal process so you can have peace of mind knowing you’ll receive the money you’re entitled to. We work hard to provide superior legal services and exceptional customer care so you can have confidence in our ability to assist you. Instead of just stepping aside and letting the government keep your money, fight your Social Security denial with Tate J Eldridge, PC by your side. Call our Amarillo, Texas office today at 806-331-8283 to schedule your initial consultation. Tate J Eldridge, PC understands how frustrating entering the Texas legal system can be. Regardless if you’re going through a family law matter or trying to earn your Social Security benefits, you’ll get the best outcome in your case if you hire our knowledgeable legal professional. We take pride in having the litigation tactics and courtroom skills to properly present your side of the story to the courts. If you’ve been searching for a reliable attorney to help with family law matters or after being denied Social Security benefits, look no further than Tate J Eldridge, PC in Amarillo. Schedule your initial consultation with our attorney by calling 806-331-8283 today! Not all attorneys are the same. Tate Eldridge has years of experience in the local community working with judges and your doctors, as well as with local agencies to assist you with your Social Security Disability claims. Since 1993, Tate has been serving those in the Amarillo community and surrounding area who need someone local they can turn to, someone they can trust to help them with their SSI claims. Tate Eldridge and his dedicated staff look forward to helping you get through the red tape so you get the benefits you deserve.